Re-vamp your shed by painting it. It’s the quickest and easiest way to make a big difference. 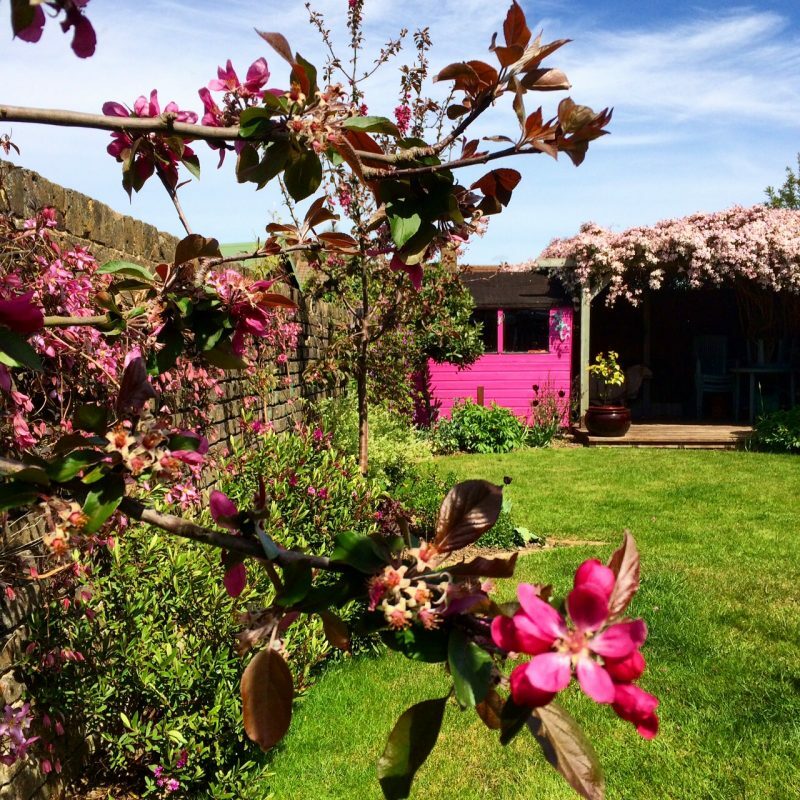 Ever since my friend Rosie Turner painted her garden shed in Barbie-doll pink (with Cuprinol Sweet Sundae), we’ve all been plotting fabulous paint transformations here in Faversham. There are some affiliate links in this post, which means you can click through to buy the paint colours. If you do, I may get a small fee, but it doesn’t affect the price you pay. 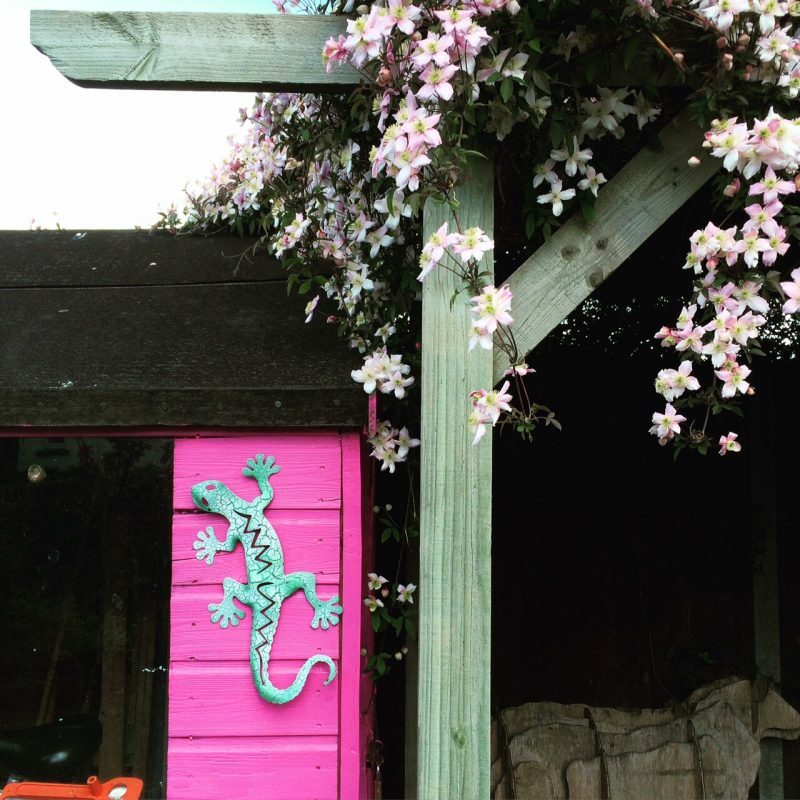 Rosie Turner’s pink shed has been one of this blog’s most popular topics. The world of painting sheds has never been so exciting. There are lots of different examples – city modernist, country calm, zingy colours. First decide if yours is a country, classic, urban or brightly coloured garden. Then dither. Heaven. I can guarantee that no sheds will be painted in a hurry – far too many options for dithering. What about Ronseal’s Elderflower and Wellington Boot Green? You could paint your shed lime green with Ronseal’s Lime Zest. There’s a lovely lime green shed below. It is at this point that the National Gardens Scheme (Kent) would like to step in to point out that if your neighbours can also see your shed, then it would be a good idea to discuss your paint colour plans with them. People can get very upset at changes, and will always appreciate being consulted. Other paint brands with beautiful colours suitable for painting sheds (and garden furniture) include Farrow & Ball exterior paint, Cuprinol and Annie Sloan Chalk Paints. If de-cluttering your shed is stopping you painting it, read this post here. 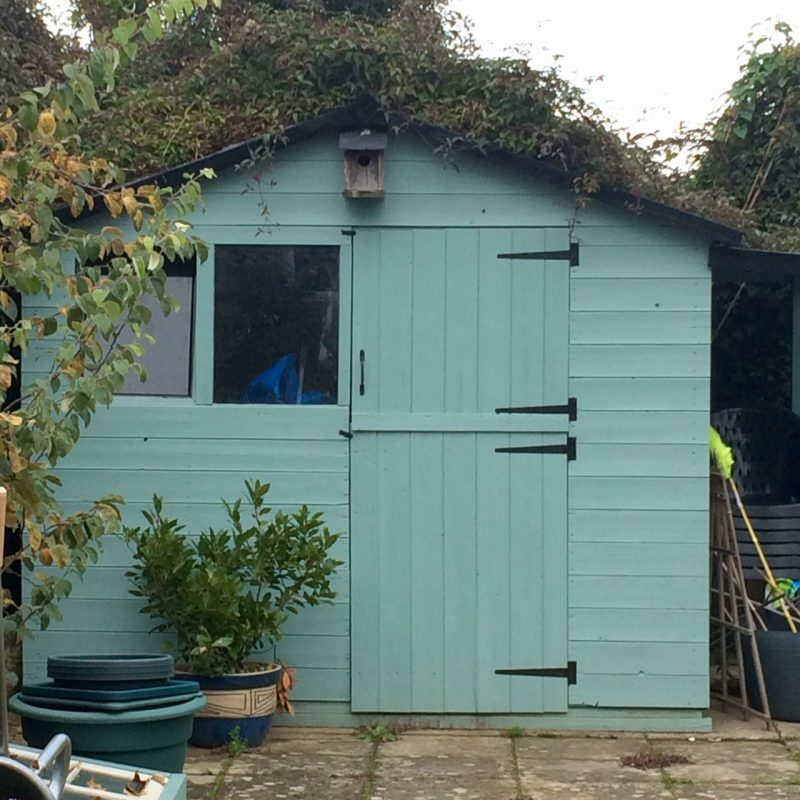 Lindsay Williams’ beautiful duck egg blue shed – a good choice for historic, romantic or contemporary country looks. You can find a colour wheel online. The basic principle is that there are three primary colours: red, yellow and blue. These are all ‘opposite’ each other on the colour wheel. Red, yellow and blue are mixed with each other, and with black or white, to come up with other colours like pink, purple and green. The nearer a colour is to another colour on the colour wheel, the more ‘harmonious’ it is. A colour that is opposite is a contrast colour. It’s important to decide which are your harmonious colours and which is your contrast colour. You need much less of the contrast colour than of the harmonious one. So if you paint your shed blue, you can use either red or yellow based colours as a contrast. 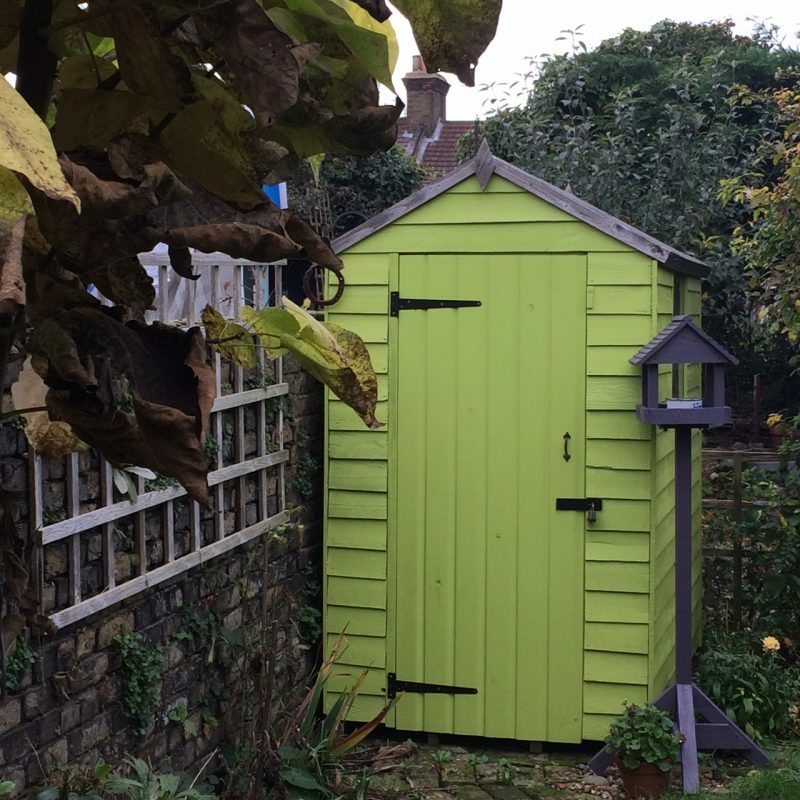 Angie painted this shed in Zingy Lime from Cuprinol. She chose a colour from the opposite side of the colour spectrum for the bird feeder on the right – Lavender. 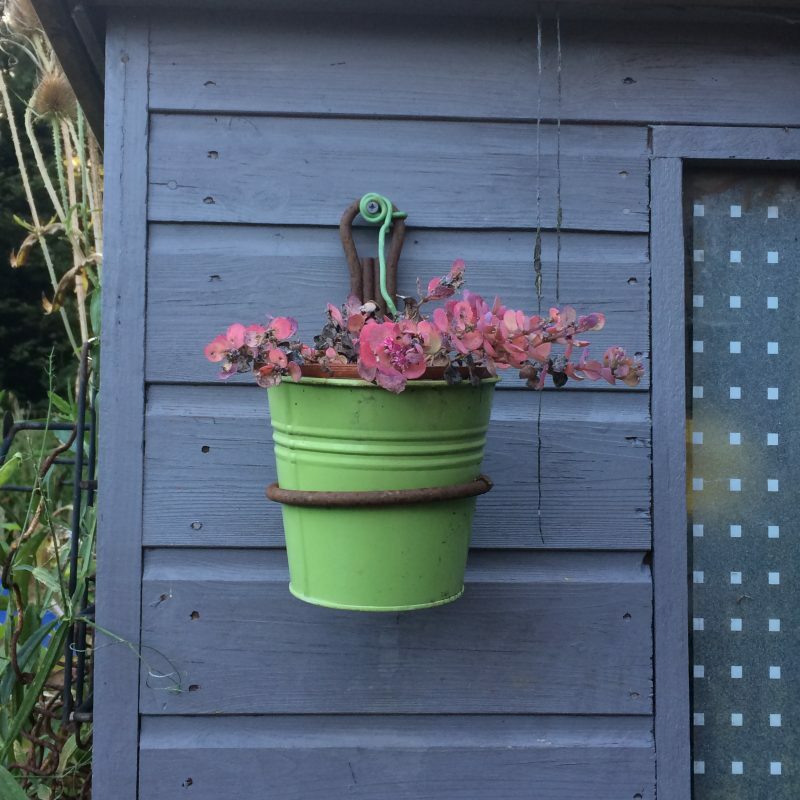 Angie has two sheds in her garden, and she has cleverly painted them in colours from the opposite ends of the colour spectrum: lime green and lavender. 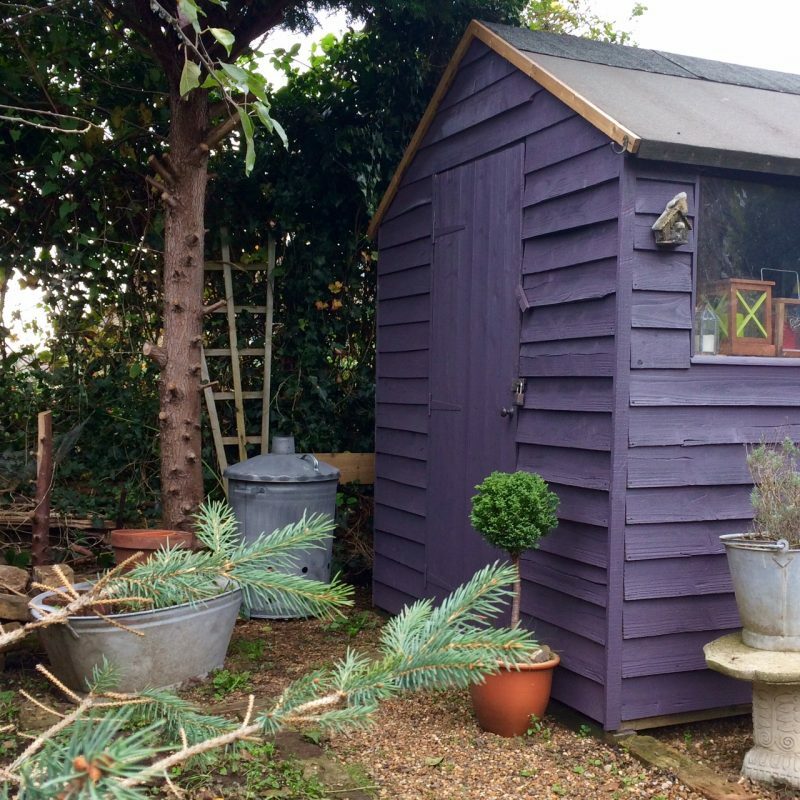 The darker shade – Cuprinol Lavender – on this shed makes it recede into the back of the garden – if she’d painted the furthest shed lime green it would have made the end of the garden look closer. Contrasting door and window frames for Vic’s ‘spare room’ shed at the end of her garden. Vic mixes her own colours, but Ronseal’s White Daisy and Cool Breeze (blue) would be a similar match. You could paint the whole door in a contrasting colour – this is Robin Grimble’s shed, seen in the Faversham Open Gardens. Ronseal’s Wood Sage would be a good match for this. Or use two contrasting colours. Here Telegraph gardening writer, Francine Raymond chooses a chic yellow/blue grey contrast. Always do a patch test on your shed – colours seem much paler under bright sunlight than they do on paint cards indoors, so you may need a darker shade than you think. …or stripes, stencils or…anything else beginning with ‘s’? 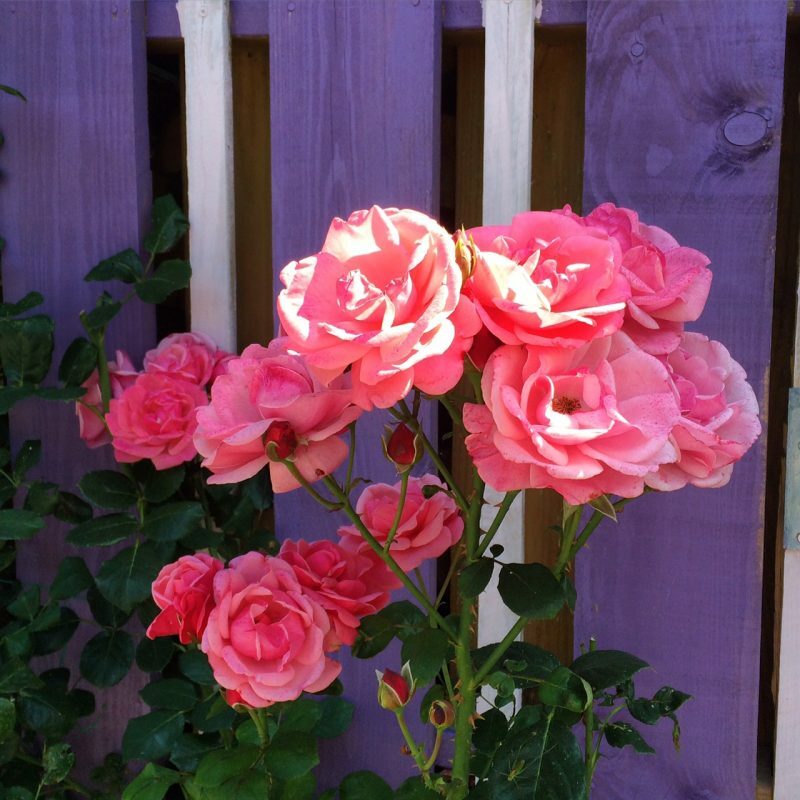 You could even paint stripes on your shed – this lavender-black-white scheme on Margy Perkins’ shed shows off the colour of these roses. 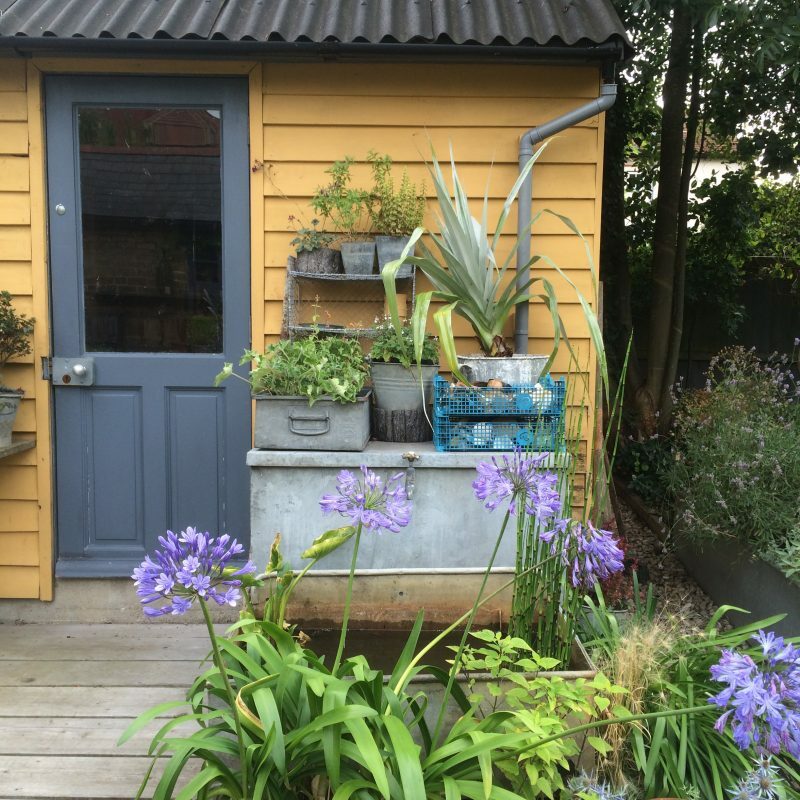 Will your shed work with your favourite planting schemes? 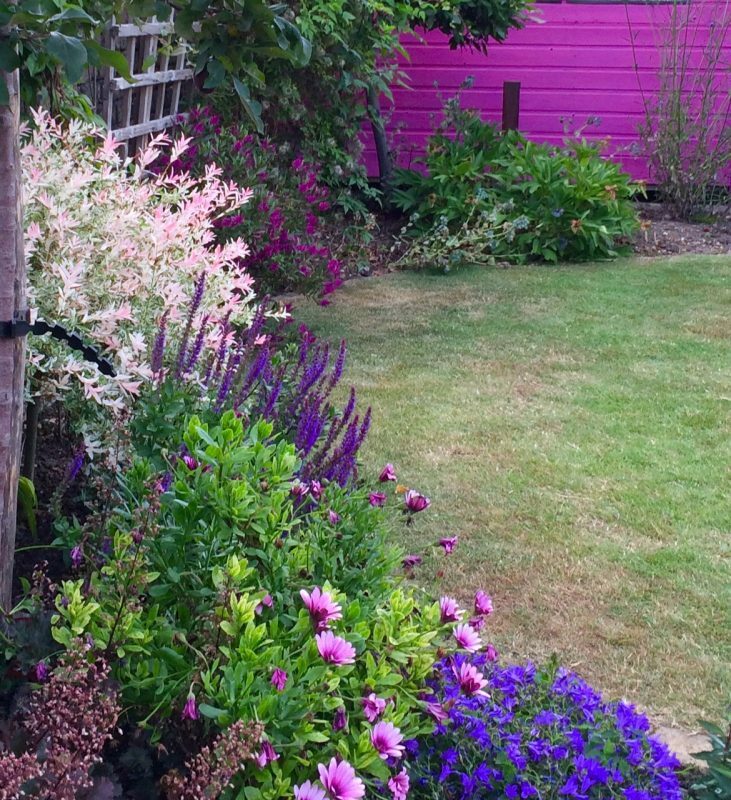 Rosie Turner’s flowers are mainly pink and purple – so they look great with her shed. 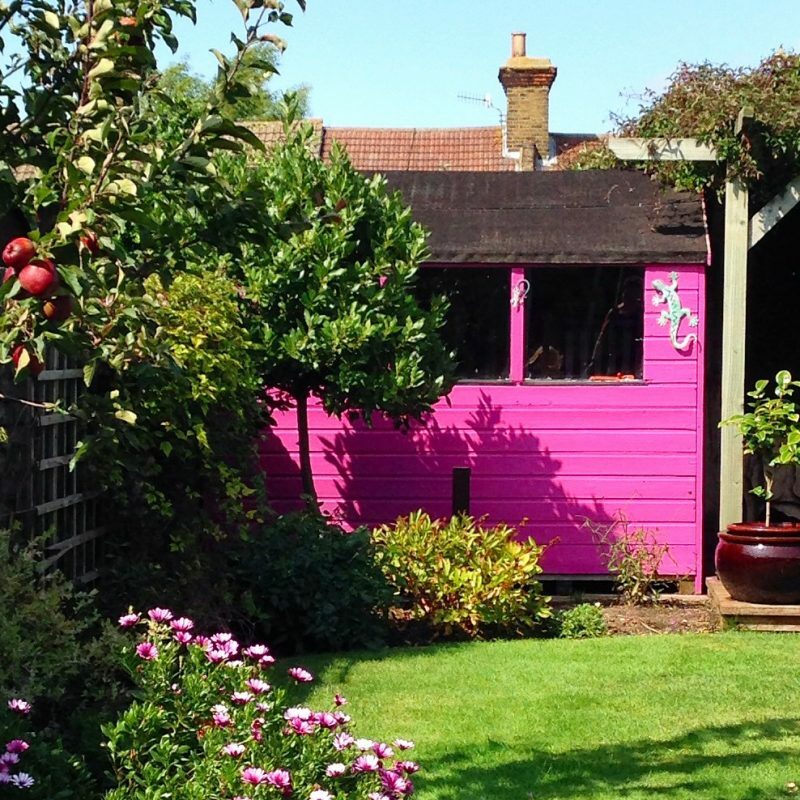 If you can see your garden shed from wherever you are in your garden, it’s worth drawing it into the general garden colour scheme. Rosie’s pink shed and her light pink clematis. Luckily, a shed doesn’t need an absolutely perfect finish. 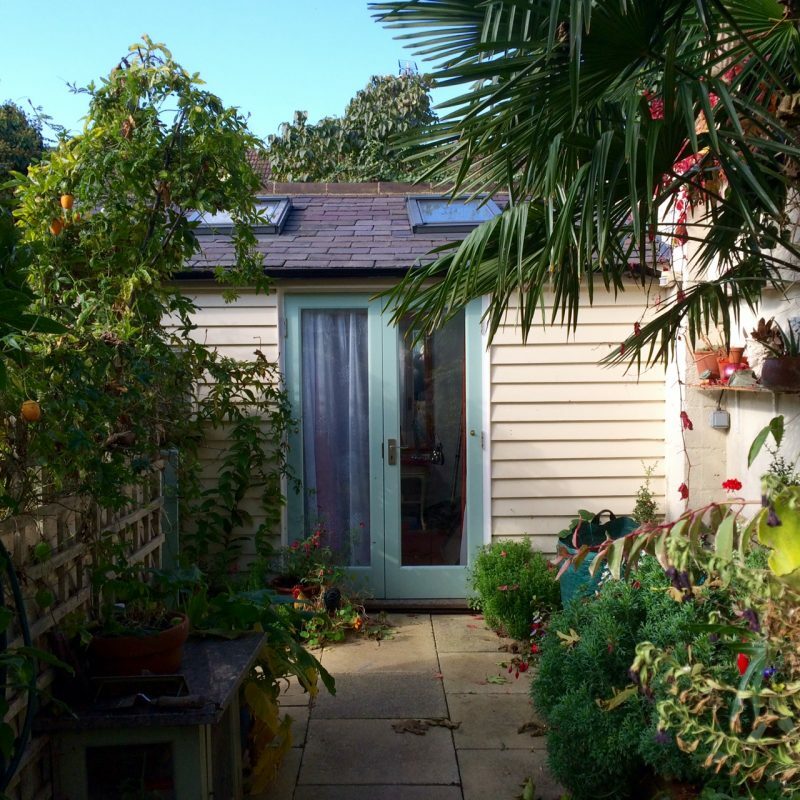 It’s relatively easy to re-vamp your shed with paint in a weekend, and it’s an amateur job. Ronseal advise you to remove the dirt with a stiff brush, and I have seen advice to ‘sand it down’ elsewhere on the internet. Sanding down a whole garden shed will take you longer than writing a book. The stiff brush will do. You could wash it with a hose, or a very low pressure soft-brush option on a pressure washer. You need to paint your shed in weather above 10 degrees, and – obviously – not when it’s raining. Allow about 8 hours to dry (ideal for a weekend project – paint the first coat on Saturday afternoon and the next on Sunday morning). Ronseal says their garden paint will be rain-proof within one hour. Painting a shed is easier than indoor painting because you don’t need quite the same standard of finish. A good starter job for an amateur decorator…. If you’re going to re-vamp your shed, pay attention to detail. It’ll be neater if you take the door furniture off before painting. For an extra touch, you could buy some new door handles or bolts, add a bird house, pot plants, signs or even stencils. You can always paint over anything you don’t like. 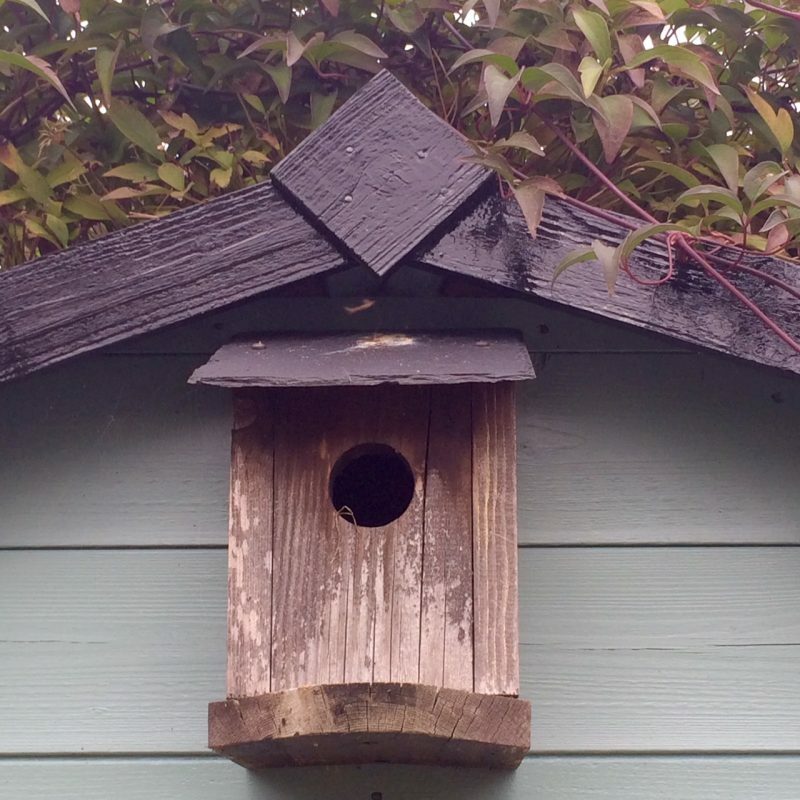 Add a trim to the roof to finish your shed off, and then hang attractive bird boxes or plant pots on it. I love Fern Alder’s green pot and pink flowers with her lavender blue shed. (Fern runs Full Frontal, a charity that encourages communities and gardeners to ‘green up’ urban streets). 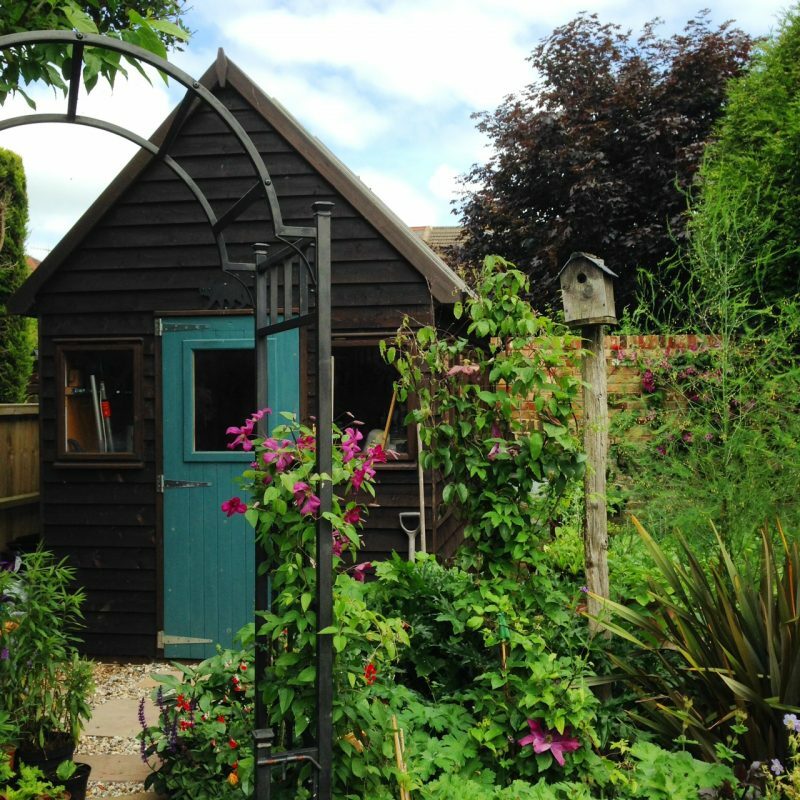 Do post any pictures of your favourite sheds on the Middlesized Garden Facebook page, or leave a comment below. 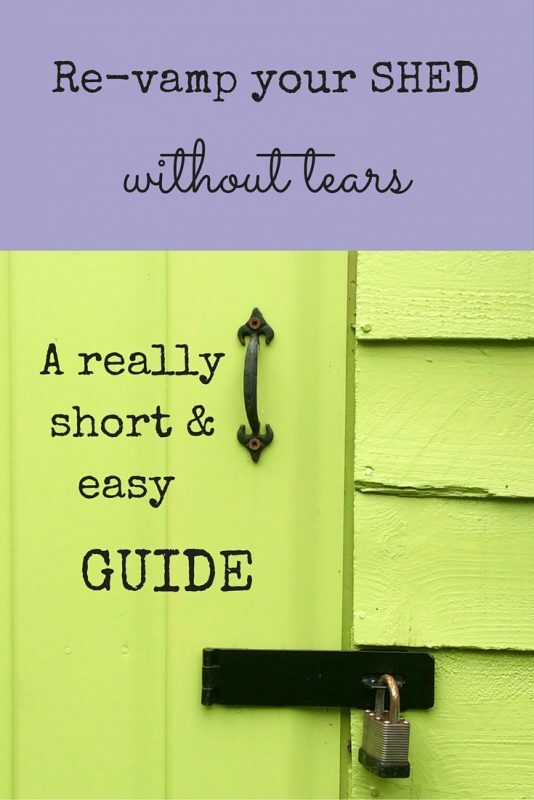 5 comments on "Re-vamp your shed – a really short & easy guide"
Wow, This has given me inspiration on repainting my garden shed… currently its brown, but it would look so much better a colour like these. Any recommendations on brand of paint? Both Cuprinol and Ronseal have good colours. And we’ve painted our shed with Farrow & Ball’s exterior paints. Pingback: Looking for garden design ideas and colour inspiration? Lovely blog and inspiring article.